CHICAGO (WLS) -- The Chicago Cubs clinched the National League Central title when the St. Louis Cardinals lost 6-2 against the San Francisco Giants. Scooter Gennett hit a tiebreaking, two-run double in the seventh inning, and the Milwaukee Brewers spoiled the Chicago Cubs' first opportunity to clinch the NL Central title with a 5-4 victory Thursday night. Chicago (93-53) was hoping to begin a 10-game homestand with a boozy celebration of its first division title since 2008. But Keon Broxton homered and Orlando Arcia drove in two runs for Milwaukee, making the Cubs wait for the result of St. Louis' game at San Francisco to find out if their season-long dominance of the Central was complete. The crowd of 41,362 cheered loudly when Hunter Pence's two-run homer in the first inning against the Cardinals was shown on the video board in left field. Chicago Cubs fans are determined to cheer their team to a division championship title Thursday night at Wrigley Field. If the Cubs clinch the will be National League Central Division champs for the first time since 2008. "This is so huge. This is so huge and if they do it at home, in September, to clinch it, is unbelievable," said Joanne Drogos, a die-hard Cubs fan, who was decked out in team regalia and ready for the game. 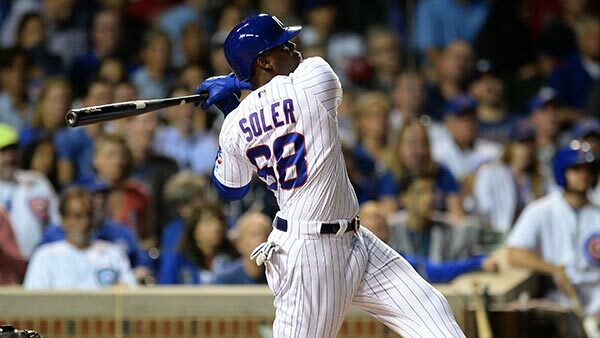 The Cubs are coming off a big win against the St. Louis Cardinals and will meet the Milwaukee Brewers on their home turf. Seats for Thursday night's game sold out completely. "I paid $56 for each ticket, I got two tickets for tonight, hopefully might make history tonight, we might clinch tonight," said fan Maurice Banks. But those $56 tickets don't guarantee him a seat. "Absolutely standing room only," he said. Around Wrigleyville, they're preparing for a party. Streets and Sanitation crews are unloading barricades so police can block the streets off for the expected crowd of fans. "It's got to be the year, man. 120 years? It's got to be the year, John," said fan Maurice Banks. At Slugger's on Clark Street, the clinch feels like a cinch. "It's happening, it's happening," said fan Brittney Johnson. "I think it'll happen. Against the Brewers, I think we've got a good shot, yeah," said fan Cody Noyes. Outside Wrigley Field, it feels like a playoff game. The Cubs faithful are soaking it up with ticket in hand. Chad Peery traveled all the way from Oklahoma. "I've never been to Chicago or anything. It's the first time, first plane ride, everything," he said. There is less suspense involved this year as there is little question the Cubs will clinch, it's just a matter of when. "Wrigley Field, the weather, closing the division off tonight. How do you beat it?" said fan Kevin Kerrigan. For fans that sit usually sit in the same spot in the bleachers for every home game, tonight's game feels like most any other. They are fans of Cubs center fielder Dexter Fowler, "Fowler's Prowlers," but they are huge Cubs fans in general and tonight is a big night for them. "It's a huge day for us Cubs fans. I mean, it's- we come here every day, we get here two hours early, we're not on the team but we're the biggest supporters of the team," said fan James Peters. Chicago police will have extra units on patrol in the Wrigleyville area, in case lively crowds get out of hand. If the Cubs win, they will be the first Major League team to clinch a spot on the playoffs this year. Last year when they beat the Cardinals to make the one-game playoff, fans emptied out onto the streets outside the ballpark and the celebration continued into the night. As in years past, tow trucks will likely be patrolling the area, looking to get rid of illegally parked cars. Drivers should not risk it. Perhaps the biggest twist in the excitement over the Cubs' clinch potential is the surging number of Google searches related to manager Joe Maddon. The most popular question? "Is Joe Maddon married?" The answer is yes: he married his wife after the 2008 World Series during which he was managing the Tampa Bay Devil Rays. Slugger Kris Bryant is the most searched-for Cubs player. First pitch is scheduled for 7:05 p.m. Thursday. If the Cubs don't clinch Thursday night, it's expected to happen sometime over the next few days. The Cubs will host the Brewers, Cincinnati Reds and the Cardinals through Sept. 25. The Chicago White Sox are also at home Thursday. They will try to win their series against the Cleveland Indians. Carlos Rodon gave up six runs in five innings Wednesday night. The Sox lost 6-1.